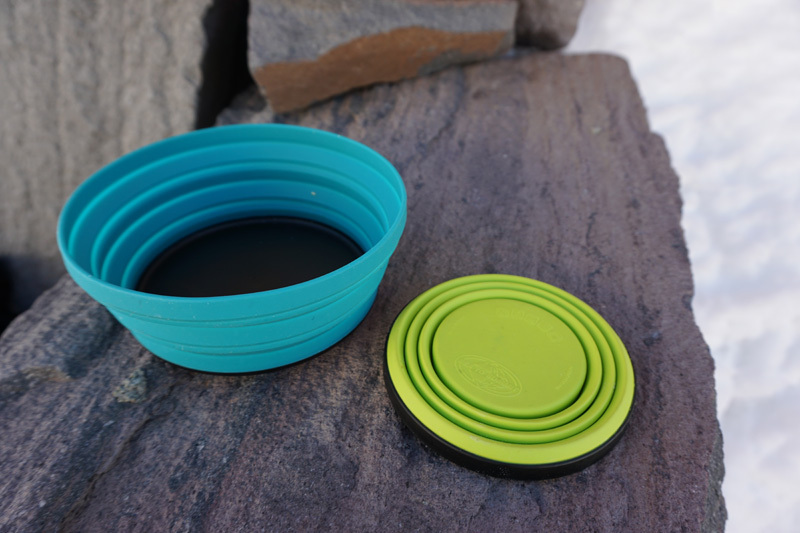 Flexible, collapsible, food-grade silicone comprises the walls of an innovative cookware line from Sea To Summit. 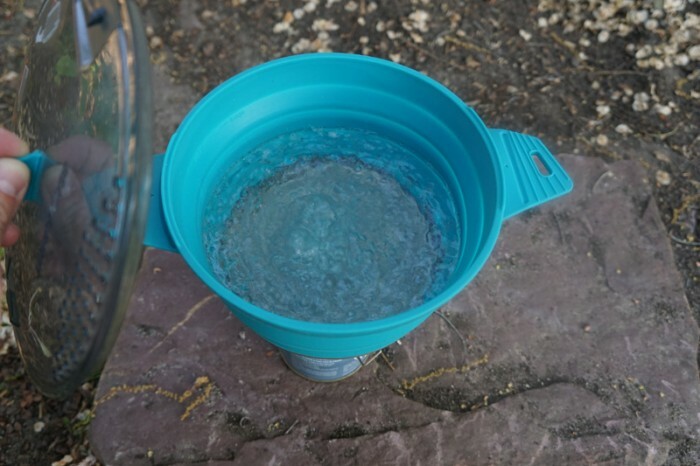 An anodized aluminum base lets you cook and boil water in the soft-walled pot. Pack space is high-price real estate, and one of the costliest plots in the bag is cookware. No matter how you stuff it or pack around it, the backcountry kitchen has always had an awkward relationship with the rest of our gear. 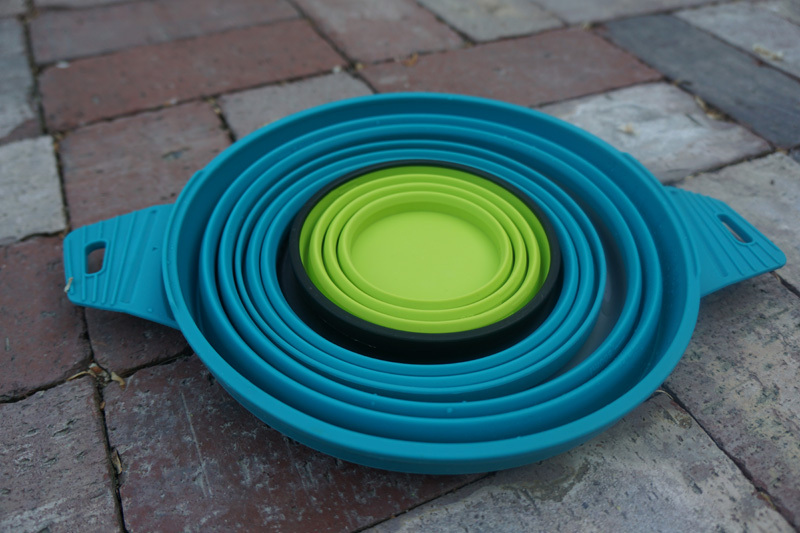 At last summer’s Outdoor Retailer trade show in Salt Lake City, Australian-based Sea To Summit (with its American office in Boulder) debuted a suite of collapsible silicone cookware to add to its X-Series tableware range. The line caught a lot of attention and reaped some awards. We were eager to put the product through the wringer and brought a few items on a ski mountaineering trip to assess its net worth. The full test is below. Available: X-Pot 2.8L (tested), X-Mug (tested), X-Bowl (tested), X-Cup, X-Plate, X-Shot, available now. More in the X-Series will release in summer 2015. Price (items reviewed): 2.8L X-Pot, $50; X-Bowl, $16; X-Mug, $13. Where To Test It: Camping, backpacking, mountaineering, overnight cycling. Who’s It For: People shouldering light loads looking to minimize bulk in the backpack. How It Works: Corrugated food-grade silicone sidewalls collapse into narrow disks around the base. Saving even more space, the sets nest inside each other; a complete pot, bowl, and mug set carves a negligible disk-shape space in a pack (about 8” x 3/4”). 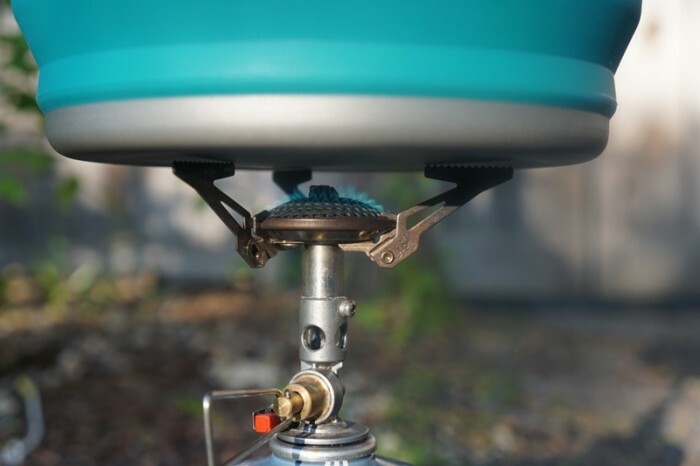 The X-Pot is designed to fit over a smaller backpacking/camp stove. 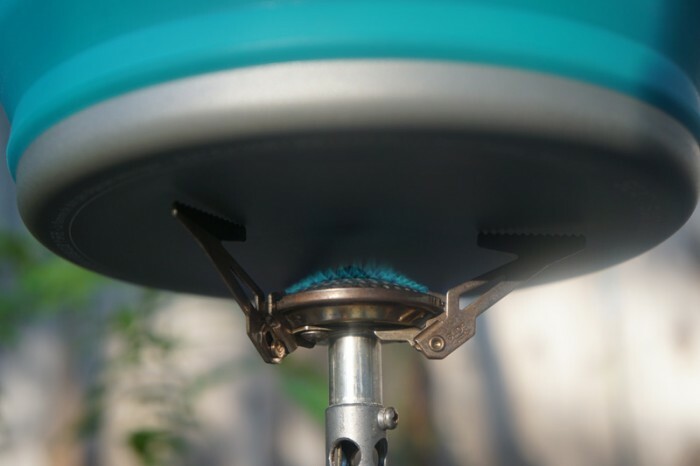 It shouldn’t be used over larger burners (like a kitchen stove) and it should never be used over an open campfire. In short, keep the open flame on the aluminum base only. To melt snow, start with a small amount of snow or water. Work up from there as the snow melts. Make sure the sides of the pot are unfolded and popped up all the way. You should not use it like a frying pan (with the sides flat down) as the silicone can become exposed to open flame in that configuration. The nylon base of the X-Bowl is durable enough to cut on (think slicing cheese, etc. ), and the heat-resistant sidewalls, though not to be exposed to direct flame, can withstand heat upward of 300˚ F.
The plate, bowl and mugs are dishwasher safe and were tough enough to shed coffee stains and day-old lasagna. Due to the anodized base, the X-Pots should not be cleaned in the dishwasher. The X-Pot lid is BPA-free and, being food-grade, the silicone (also BPA free) won’t leach chemicals. Weight: The X-Pot weighs 9 ounces empty. It is heavier than most of the line because of the aluminum base. The X-Cup is only 1.6 ounces, and the X-Bowl is 2.8 ounces. Killer! The series is designed to efficiently nest inside each other, conserving gobs of pack space. The silicone material insulated surprisingly well. The X-Mug is graduated at both ¼, ⅓, and ml increments. 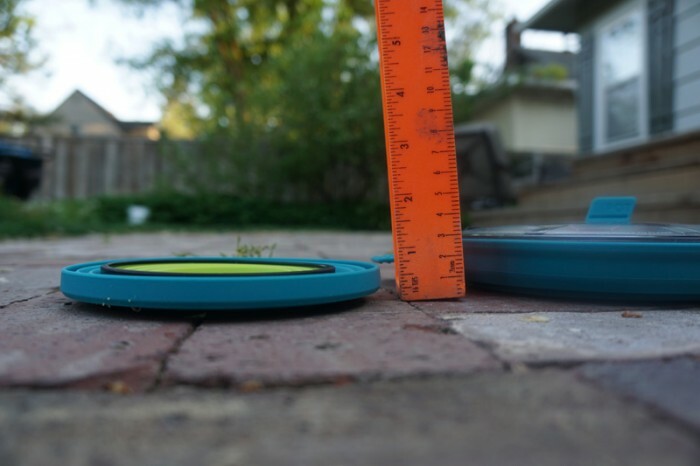 Room For Improvement: The smaller the product, the harder it is to compress. I found the X-Mug a challenge to fold in the hand, but it’s pretty easy when squished down over a hard surface. With all its nooks and folds, the products don’t clean up in the field as easily as standard alloy cookware. Who Should Buy It: Outdoor enthusiasts who value real-estate measured in price per cubic inch. Parting Thoughts: For most of my trips into the yonder, I’ve whittled my cook kit down to an alloy mug and a spoon. And it wasn’t for weight — but rather for space. The X-Bowl and X-Mug took up surprisingly little space, and at the end of a meal I simply threw the set in my food bag and forgot it. For cooking, the X-Pot seems to have bent the time-space continuum of pack space. For a pot that you can boil water and cook in its space saving is almost a miracle. The X-Series is a sweet little perk for your camp kit. If you are on the fence with investing in the $50 pot, try starting with the 16oz volume X-Mug. Though it was more of a challenge to collapse than the bigger items I found I used it more than the bowl — perfect for soup, a cup of joe, or just about anything else out there.